STANFORD, Calif. -- I'm going to go wayyyyy out on a limb here. When Serena Williams returns to competition here Wednesday, the world's top-ranked player will serve the ball powerfully over the net. That definitely was not the case during her last, unsettling performance at Wimbledon four weeks ago. In what was termed a viral illness, Serena was so dizzy and weak that day she struggled just to bounce the ball on the ground while trying to serve in her doubles match with sister Venus. When she did manage to toss the tennis ball in the air and hit it, she double-faulted four times in a row. The last time we saw Serena Williams, this was the image we were left with, but the world No. 1 is ready to move on. 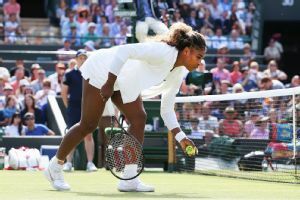 Apart from an endurance runner stumbling with dehydration and extreme fatigue in high heat, I do not recall seeing an athlete so dizzy, off-balance and incapable of performing as Serena that day at Wimbledon. And those few endurance athletes were like that only at the end of a draining race. This was at the start of the match. If you were feeling that woozy, why even play? Serena said she did not feel good walking onto the court that day, but did not appreciate how sick she really felt until after she left the court -- she said Venus told her repeatedly to stop playing. "I'm your big sister, I'm telling you -- you have to leave." Serena said it reminded her of when she was sick several years earlier, presumably referring to the embolism that hospitalized her in 2011. "After this happened I kind of had that flashback," she said. "When you're in this moment, you don't realize how sick you are." Monday marked Serena's first meeting with reporters since that disturbing performance, but her replies did not fully answer all the questions about what happened. 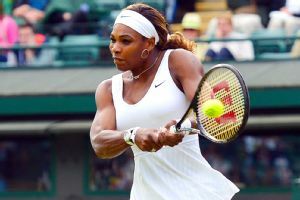 There was a lot of speculation about Serena's condition that day at Wimbledon, with Martina Navratilova expressing doubt that it really was just a virus. Serena maintained that it was a viral illness and that doctors required she stay at Wimbledon several days to recover, but she offered no specifics beyond saying she would undergo further tests when the 2014 season ends. "I heard a lot of the response weeks and weeks and weeks later," Serena said of speculation and rumors regarding the illness. "Because I didn't leave my house or bed for a few days. By the time I read about it or heard about it from a few people, I was just like, 'Oh, really?' I had already moved on; I had just started working out and started to play again." Having taken some vacation time in Croatia -- by which time she had recovered enough to post videos of herself catching ice cream in her mouth -- Serena will try to get her groove back in the Bank of the West Classic here. Angelique Kerber said she watched Serena practice Monday and that she looked like she was in her usual top form. "She was back, for sure," Kerber said. "She plays good. So let's see." Serena had perhaps the greatest season of her life in 2013, winning the French and US Opens, plus nine other WTA titles while losing only four times the entire year and regaining her No. 1 ranking. She won 78 matches overall, 20 more than any other year in her career. This year has not gone so well. She has won three tournaments -- take that, Sloane Stephens -- but no majors and lost in the third round at Wimbledon and the second round at Roland Garros. Despite a subpar season by her standards, Serena Williams is still the top-ranked player in the world. She is still ranked No. 1 -- next week would be her 200th week in the top spot -- and only four players have ever been ranked No. 1 more than that. She has 17 career Grand Slam titles, one shy of Martina and Chris Evert. Can she tie them? Pass them? "I got stuck at 13 for a while. And I was really depressed about it. I'm never going to get to 14!" Serena said when asked about the numbers game. "And I think that was before I got ill. I was stuck at 13 and I was there for a while. I thought about that just a week ago. And I was like, 'Serena, don't put pressure on yourself.' I keep saying that I won't think about the numbers, but everyone is talking about it; everyone is thinking about it and maybe subconsciously it started to twirl in my mind and fester in my brain. "I just need to relax and remember that time and that I've been in this position before. If it doesn't happen this year there is always next year." Well, maybe. Serena turns 33 in two months and after the past seven months -- as well as that one day at Wimbledon -- the question is whether age is beginning to catch up with her. As Kerber said, we will see how she does here, where Serena won the past two times she played this tournament. My guess is she will answer questions about where her current game stands more directly than the questions about that disturbing day at Wimbledon.